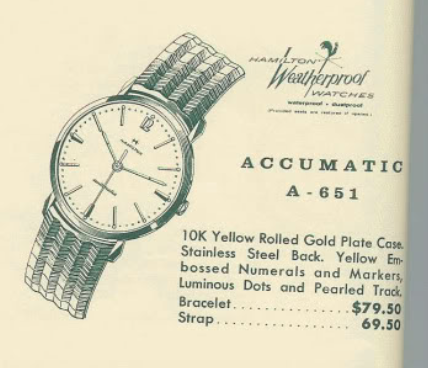 Hamilton liked to keep jewelers on their toes in the 1950s, as there are lots of models where the dials changed from one year to another, even though the model was the same name. The 1959 Automatic K-650 is one example. 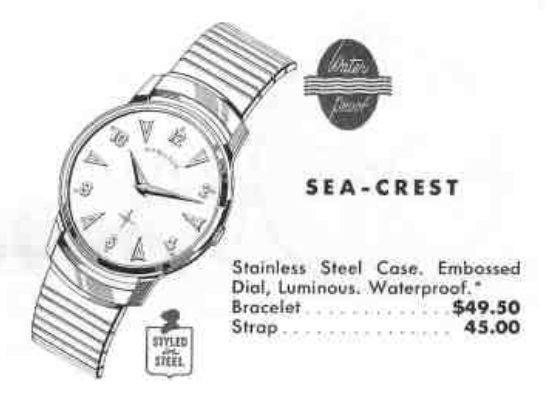 The 1958 Sea-Crest is another. In 1958 the Sea-Crest was introduced with an alternating numeral and marker dial with luminous hands and dots. Although the model was produced for four years, only the 1958 and 59 years had this dial. 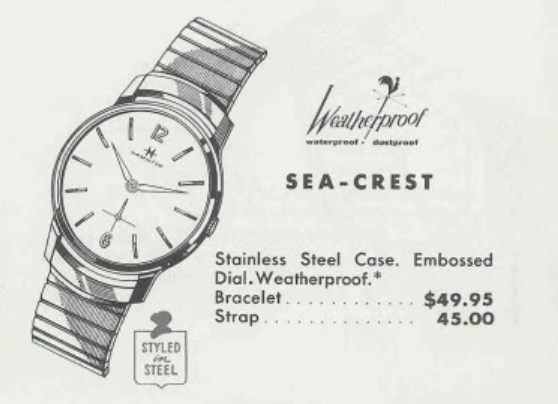 In 1960 and 61, the Sea-Crest was changed to a non-luminous design with numbers at 12 and 6 and stick markers at the other hour locations. The expansion bracelet was also changed. Only the case and the movement were consistent with the earlier version. Behind the dial in the two-piece case is a 17 jewel 673 movement based on an A Schild 1200 grade. I recently received a Sea Crest in need of a little TLC and I was surprised that I hadn't already had one on the blog. There are a LOT of Sea-somethings in the Hamilton line-up and I now get to check another one off the list with this project. As received it's in pretty good shape. The dial shows that moisture has gotten past the crown and compromised the finish. There's not much I can do about that. If I try to clean it, I may lose the printing. The case back has a lip between the lugs that makes it clear that this case back pops off. The movement inside looks to be in good shape - fortunately there's no apparent rust inside. I don't know when this watch last saw a watchmaker but there's mainspring grease on the back of the dial that has leaked out of the barrel. The dial-side of the main plate looks fine with the exception of the tab on the set bridge. It has broken off. This spring, also known as a yoke, is what keeps the watch in the setting position or winding position and it flexes every time you set the time. It's not unusual to find this part broken from decades of fatigue. The hour hand is losing it's luminous paint so I'll clean both hands in the ultrasonic with the rest of the parts and then re-lume them. Here's a better look at the set bridge and the broken tab. This crystal is a bit worn and scratched up, so I'll replace it. The hands have a fairly low profile so I'll try a 30.8mm GS PK style crystal and switch to a PHD if the PK is too low. The hands are now clear of old paint and I'll relume then with modern paint that charges in light. You mix the paint in a little bowl and then carefully apply it to the back of the hands. I support the hands with peg wood stuck into a pith wood block. Once the paint dries I will trim it with a razor so it's nice and clean looking. The movement is running with good motion. It's off to the timer to listen to it's ticking. Uh oh... this isn't what I was hoping to see. I suspect I have some lint or something on the hairspring. My shop it's exactly dirty, but it's not exactly clean either. It's part of the challenge of working in my basement man cave. There is the usual amount of dust and whatnot to contend with. It took a while but I found a stray fiber of some sort stuck to one of the inner coils of the hairspring. It was quite a pain to remove. With that removed there's nothing wrong with this watch's performance now. The PK crystal did the trick and keeps this watch looking sharp with a sleek low profile. The new lume on the hands and dial complement the white dial nicely - and now you'll be able to read the time in the dark (at least until the charge fades). There's nothing I can do about the toning near the crown - short of getting the dial refinished. It's not that bad in my opinion. Now I just need to find a 1960/61 version. Earlier this year, in March specifically, I posted a mystery model from 1973 that looked a lot like the 1968 Thinline 6505. As fate would have it, I recently received a 6505 for an overhaul so now I can make a direct comparison. 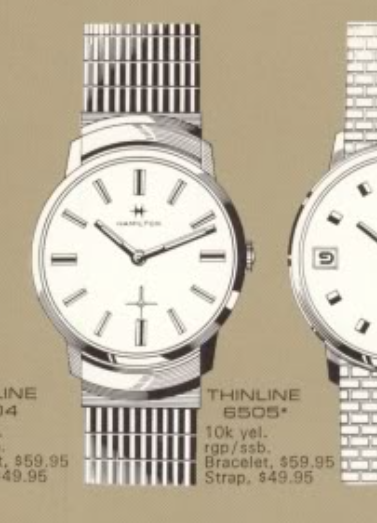 The Thinline 6505 was issued in 1968 and 1969. The Thinline 6505 has a 10k yellow RGP bezel with a stainless steel back. It was offered on a strap or a specially selected bracelet. My project watch is clearly identified as a Thinline 6505, especially since it still has it's original Kreisler expansion bracelet. It's in good overall shape and has been to a watchmaker at least once in the last 50 years because it clearly has a replacement crown. 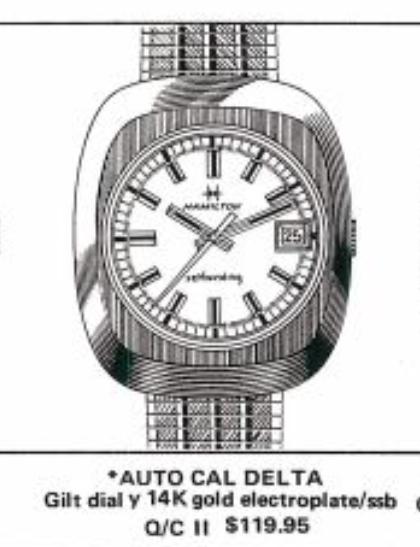 The back of the watch is noticeably different than the 1973 mystery model. Like the mystery model, this watch has a 17 jewel Hamilton 639 movement based on a Buren ebauche. By this time, Hamilton owned Buren so this is a 100% Hamilton movement, just it was made in Switzerland and not Lancaster PA. The crystal looks "okay" but the center of it is actually a little crazed and polishing will not remove crazing. So I'll replace it. I'm going to try a PK style low profile crystal but I may have to switch to a PHD. A PK is a little low and the PHD is a little taller than the original crystal. Either way, a 29.5mm diameter will do the trick. Everything is cleaned, dried and sparkling, including the bracelet. The movement is ticking away with good motion. Nothing wrong with this performance but the blurry photo leaves a little room for desire. I'll leave it running a smidgen fast as it will likely slow a little as it settles back in. My pillow shot in my light tent reveals that the bracelet actually has a little bit of wear through to the high points. You don't see that in regular lighting but my camera and light tent are merciless. I ended up using a PHD crystal so the minute hand wouldn't rub the crystal. This watch turned out great. Here's the 1974 912373 watch for comparison... very similar, don't you think? Definitely not the same though.